Batalá in Washington, D.C. is part of a larger Batalá family created in 1997 by Giba Gonçalves. Born and raised in Salvador, Bahia in Brazil, Giba was living in Paris when he first had the idea for the band. Open to anyone with an interest in learning the samba-reggae beat, the band started off with 60 people. From Paris it spread to other cities in France, Belgium and the United Kingdom. In 2003, the band finally made its way back to its origins, brought to Brazil by Paulo Garcia, also the founder of the Portsmouth Batalá . Composer and musical director, Giba enlisted the help of friends from the bands and from Salvador in order to create the visual identity of the band. The instruments and clothings are all manufactured in Salvador, Bahia, where the band has a social program that gives jobs to many families. From there they are shipped to the bands around the world. In 2007, the newest branch of the Batalá band was created in Washington, DC, expanding the reach of the band’s music to the United States. Today, there are 30 and counting Batalá bands around the world. 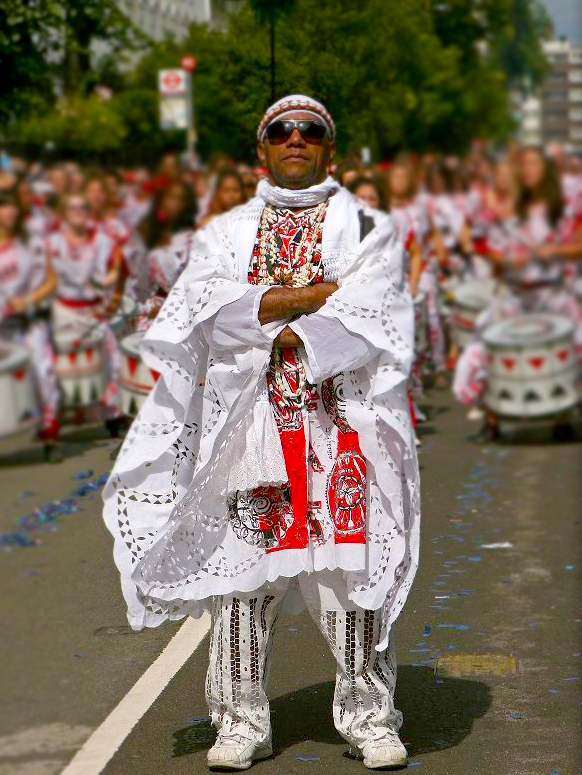 Surdo 1 & 2 are the pulse and heartbeat of every samba band. Each drum is played with alternating beaters. Surdo 1 is tuned low and played on the first beat, Surdo 2 is pitched higher and replies with the second beat. These “bookends”, with their energy and insistent driving rhythm, push the beat forward and provide a solid base for other patterns. The Dobra is the the mid-range sound, the melody drum. This smaller version of the Surdo, played with two beaters, is unique to samba-reggae. The dobra has a particular pattern for each of the pieces, the off-beat pattern featuring regularly, creating the reggae feel. The dobra plays complex patterns of drumming that combine space and notes. The Repique is played with two flexi sticks, this drum helps call in the breaks and provides a “double layer” of clave to add to the snare. Probably 90% of the patterns played by the snare and the repique are the same. The difference is the sound made by the two sticks, lightening loud and snappy, like popcorn going off. The snare gives the upper-range of sound, the “white noise” that fills in the spaces left by the other instruments. The snare is the drum that can play with the most nuance and expression.